Blue Yeti Microphone is well-known for it’s advanced and top-notch features for the professional voice recording users or singers. Furthermore, it is a high-end plug-and-play USB microphone that comes with the built-in voice interface. Therefore, it’s still one of first-pick USB Mics for many voice production users. 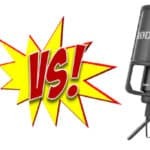 Despite being one of the best professional mics for recording podcasts, voice productions and singing, Blue Yeti & Yeti Pro mic stand poses a significant weakness of the mic recording quality itself. Many existing users suggest that it’s better not to use its original mic stand because it does affect the recording quality significantly. 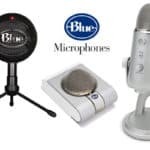 It’s recommended that you should take some efforts to search the suitable aftermarket or replacement Blue Yeti USB mic stands that suit for your recording purposes. Why Should You Change Your Blue Yeti Mic Stand? What Are The Factors You Should Consider Before Buying A Mic Stand For Your Blue Yeti? 3) Shock Mount For Your Yeti? No doubt, the standard desk stand of the Blue Yeti is very stylish and futuristic in the design perspective. However, the design will not fit all the users’ needs. Particularly for podcasters and singers, they might find it’s quite difficult to use with the standard mic stand. Many of them were thinking of finding an alternative mic stand to improve their recording experience, and voice quality just after using it for few days. Too Short: Users have to make sure that their head and mouth is very close toward the mic while recording. Very Sensitive to the Desktop Noise: It will pick up any noise from the desktop surface because its mic is very close to the desktop surface. The noise of keyboard typing and desktop surface tapping/scratching are easily recording into the Blue Yeti USB microphone. Voice Pick-up Direction Issues: The Blue Yeti is a side-address mic that picks up voice sources in the parallel directions of the diaphragm. In general, It picks up the all the voice from the front and back of the mic body, but not from the end of the mic's head. This is the most devasting problem for most users since the Blue Yeti USB mic is quite short and it's not parallel with the mount level of the user. Thus, the Blue Yeti Mic's end is always pointing to your mount from the desktop if you are in the sitting position. Is the mic stand mount screw compatible with the Blue Yeti’s threaded mount hole? Blue Yeti’s threaded mount hole is at size 5/8. You have to search for the mic stands that are using the 5/8 threaded mount screw. Alternatively, you can buy an additional mic screw adapter that fit into the bottom threaded hole of your Yeti to make both of them compatible. The “5/8-Inch Male” mic screw adapter is the one you should be looking for. How about the size of the “female mic screw size” for that adapter? Well, it depends on the size of the mic stand’s mount screw. 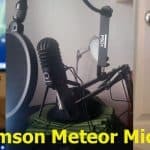 The compatibility factor the pop filter with the mic stand must be taken into consideration too. It doesn’t matter whether you are using the boom mic stand or the boom stand, you have to make sure it can be easily attached to the stand. However, most filters on the market now come with the adjustable mount for more flexible installation. The Rode PSA1 boom arms are made for these flexibility purposes. 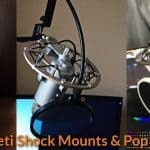 Are you going to use a shock mount on your Blue Yeti? If you want to use one, then you have to make sure that the mic stand’s mount screw is compatible with that shock mount. Can the stands handle the microphone’s weight? Blue Yeti mic itself weighs at 1.2 lbs without its original bulky desktop mic stand. Thus, you have to make sure the aftermarket stands you selected can handle the weight of 1.2 pounds or more. The Rode PSA1 is well-recognized as one of the most popular boom arms for Blue Yeti Mic. The body of the RODE PSA1 boom arm is made of metal, so it is very solid and sturdy. And it is capable of handling the mic that weighs from 1.5 lbs up to 2.4 lbs. In my opinion, if you want to find a boom arm stand that can handle the 1.2 pounds Blue Yeti mic, a shock mount and a pop filter. This RODE PSA1 is a boom arm that is more suitable for this kind of weight handling purposes. Furthermore, It does come with the”3/8 to 5/8” threaded screw adapter. And it’s compatible with the Blue Yeti Mount hole. You must use the provided “3/8 to 5/8” adapter in order to screw the PSA1 mic stand to the Blue Yeti Mount hole. You can have two desk mounting options using the PSA1, include Desk-clamp attachment and the desk-insert installation. The dual-axis swivel mount is quite useful and convenient to position the microphone around the corner of the desk. The desk-clamp attachment can mount in the desks up to 55mm thick. However, for the desk-insert installation, it can be installed on the desks up to 70mm thick. 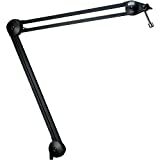 The PSA1 boom arm can be stretched vertically up to 84cm or 33 inches and up to 82cm or 32 inches in horizontal range. And it is flexible enough to the point that you can rotate it at 360 degrees range. And it also includes the Velcro cable wraps in the package to keep you mic cable more organized along the arm. There is a built-in heavy-duty spring mechanism that attached to the joints of the PSA1 boom arm. Thus, the user can change the position of the arm conveniently, and it will stick to the position where you have left it. And it will not pull down by the weight of the heavy Blue Yeti setups. Overall, it is quite a heavy-duty, and quality boom arm microphone stands you could ever find on the market. In fact, I prefer this RODE PSA1 boom arm mic stand over other stands that are available in the market now. The Heil Sound PL-2T overhead boom makes use of impressive internal springs that provide the perfect balance for this mic stand. It does away with those unsightly mechanical outboard springs that are mostly used in lesser quality booms. The Heil Sound PL-2T basically can handle microphones up to 3.5 pounds in weight. You must remove the back and top plates to easily thread the cable inside the boom. This process does away with connectors. The Heil Sound PL-2T comes with a standard C-clamp mount. The PL-2 is receptive of 5/8” threaded mic shock mount or clips. The chrome threaded stem can be easily locked into place depending on which type of shock mount or microphone is used. The Blue Compass is definitely a premium tube-styled desktop boom arm characterized by internal springs and built-in cable system. 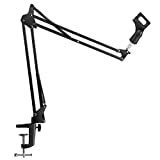 This boom arm can be readily used in a variety of applications such as in broadcasting, game streaming, voice-over productions, and podcasting. It provides a remarkable operation because of its state-of-art design. It is also compatible with any microphone that weighs 2.4 pounds and below. It is ideal for use even with Black Spart SL and Blue Yeti. It also comes with 20′-XLR cable and pop filter. The Blue Compass is a new product rolled out by Blue, and it is taunted as the first boom arm from Blue. It is definitely of high quality that incorporates ingeniously hidden cable management. It also has fantastic hand-tightened springs and allows for 360-degree rotation. Moreover, it is capable of holding up to 2.4 pounds of the microphone and is intelligently designed for secure clamping to your desk. It is ingeniously designed for heavy-duty mounting. It has a sleek and sturdy design that can support all types of microphones that weigh from 1.3 pounds to 2.86 pounds. 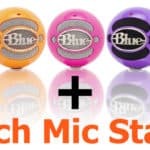 It is compatible with more many microphones, especially, those of the Blue Yeti microphones. It features an upgraded desktop mount clamp. Compared with older versions or other brands, it is sturdier and can support heavy-duty microphones for longer time. It also has a wider mouth that could open up to 2.2″ to accommodate most desktop thickness. It also has an internalized spring that enables it to support heavy microphones without necessarily sagging. Saddled by heavy microphones, it can still lower or raise itself according to your preferred height. It is very easy to adjust, and you can set it up quickly. It is also capable of 360-degree rotation, and you can position it according to your preferred position. Moreover, its adjustable arm is easily folded for convenient portability and safekeeping. Eastshining Upgraded Adjustable Microphone stand is one of the most reliable and sturdy mics at hand. It has super strong springs that are easily adjustable and have awesome bearing capacity. You can easily adjust the diameter of the mic clip by adjusting or changing the O-rings on the shock mount. This stand complements perfectly those mics with diameters of 4.5 cm. 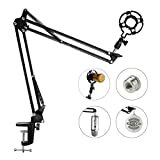 Eastshining Upgraded Adjustable Microphone Suspension Boom stand comes equipped with instruction and adaptor. It is quite easy to set up and complements perfectly the Blue Yeti and Snowball mics. 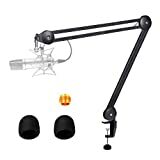 With regards to its safety and stability, its dual suspension springs on each of its boom arms readily protect the microphone from shaking and suddenly dropping. it also prevents the mic from making unnecessary noise. 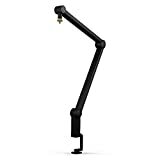 It comes with one table-mounting clamp and adjustable positioning screw that allows you to easily clip it on the desktop that has around 2.15″ thickness. With this feature, you can readily mount it on any table without the need for any other accessory. The table mounting clamp is lined with a layer of sponges to prevent fraying and damages to your desktop. It also has a soft mat or rubber washer for added protection. It is also made of all-zinc construction that makes it very compact and easy to carry around. It can carry up to 2kg of weight. Lastly, it is foldable and has adjustable legs for convenient transportability and portability. InnoGear Microphone Suspension Mic stand is an upgraded desk mount that is built with anti-scratch pad technology and comes with a wider mouth that could easily fit into 2″-thick desktop. Its microphone clip is around 1.1″ that is suitable for various applications such as in broadcasting, stage, studio, or even in family applications. You can attach your Blue Snowball and Blue Yeti using the male and female threaded screw adapter. It is important to note that the mounting hole of the Yeti mic is occasionally bigger by a tiny fraction than the industry standard of 5/8″: hence, you sometimes need to use thread tape to wrap around the mounting screw for effective mounting of the Blue Yeti mic. This boom stand is made of durable steel and is exceptionally lightweight. It is quite easy to position and moves around from one location to another. It also has rubber feet that reduce vibration and provide added protection and stability to the stand. Lastly, it has a strong spring and comes with extra positioning screw for reliable mounting of heavy duty microphone. In my opinion, Rode PSA1, Heil Sound PL-2T, and the Blue Compass boom arms are the most quality, professional and heavy-duty microphone stands for Blue Yeti / Yeti Pro as compare to other cheap boom arm mic stands that are available on the market. If you intend to setup your Blue Yeti mic with an additional microphone shock mount, Rode PSA1, Heil Sound PL-2T, and the Blue Compass are the microphone stands you should use without worrying about the problems of mic tipping-over. However, you can go for the more affordable models which are made by iksee , Eastshining and InnoGear if budget is your primary concern or you are going to use it without a shockmount. The only issues of using these affordable mic stands for your Blue Yeti / Yeti Pro are the possibilities of mic tipping over if you set it up incorrectly and the spring-stretching noise when you adjust the mic stand.